Whether they face challenges adjusting to college or difficulties back home, a variety of factors can stand between students from historically underserved backgrounds and a college degree. As universities work to address these obstacles, one tool has come to stand out as especially effective: the power of individualized attention, especially through mentorship. “No one has acquired or attained any level of success without the contribution or the assistance of someone else. Whether that someone else has laid a foundation for them, or whether they’ve offered direct guidance and support,” said Patrick Smith, executive director of Indiana University’s Mentoring Services and Leadership Development office, a program supported by the Office of the Vice President for Diversity, Equity, and Multicultural Affairs. The benefits of mentorship were on full display throughout the National Mentoring Symposium, a daylong conference that took place on the IUPUI campus Nov. 10. Now in its sixteenth year, the National Mentoring Symposium attracts students, faculty, and staff from around the country to share their experiences and learn about best practices for implementing mentorship programs. Through a series of presentations networking opportunities and a keynote lecture, attendees leave the conference with the tools needed to become better mentors to the students they serve. The National Mentoring Symposium came from humble beginnings. According to Landon Brothers, co-chair of the symposium, the event began in 2002 as a way for students in IUPUI’s mentoring programs to gather and share their experiences. Soon enough, however, other universities took notice of the symposium’s unique focus on student mentorship experiences. Sixteen years later, the National Mentoring Symposium has grown into a nationally recognized conference that welcomes groups from as far as Nevada. 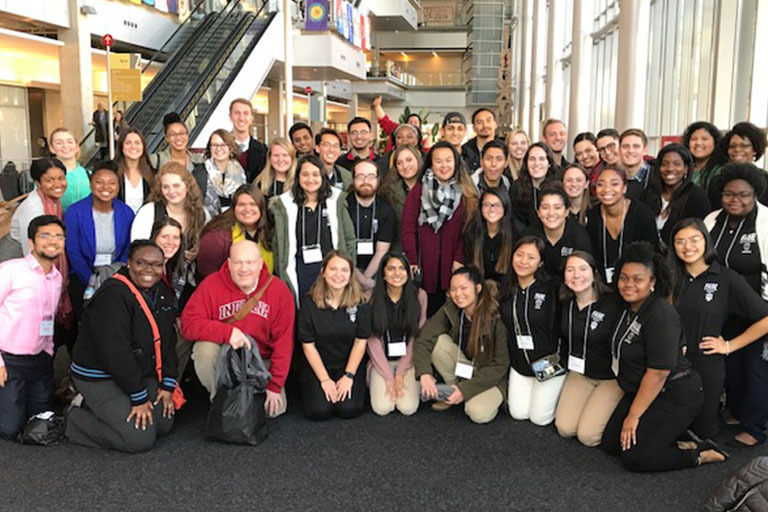 Despite this national focus, Indiana University student mentors remain a central presence at the National Mentoring Symposium. According to Smith, a group of students from the Faculty and Staff for Student Excellence (FASE) program has attended the conference since 2007. This year, over 30 students in the FASE program will attend the conference, along with several dozen IU Bloomington students from other mentoring programs. “They don’t just bring back or acquire knowledge, they also share the knowledge that they have as it relates to the mentoring they’re involved in,” Smith said. This year, a key focus of the National Mentoring Symposium was the intersection of mentoring with key issues of diversity and inclusion in higher education. The keynote lecture of the event featured Dr. Moira J. Cullen, acclaimed diversity trainer and author of 35 Dumb Things Well-Intended People Say: Surprising Things We Say That Widen the Diversity Gap. During her lecture, Cullen illustrated the critical dynamics that students must be aware of when mentoring individuals from a variety of backgrounds. According to Brothers, such concerns are key for effective mentors, a need that he believes the National Mentoring Symposium helps serve. Ericka White is one student who has benefitted from both sides of the mentoring relationship. A senior from Indianapolis, IN, studying information science, White got involved with the FASE program as a first-year protege and went on to become a mentor. At this year’s symposium, she partnered with other mentors to present on issues that minority students face when attending college, as well as how mentorship relationships can overcome those challenges. In staying involved with mentoring at IU, White also pays tribute to the mentoring relationships that led her to succeed in college, in the first place. As a first-generation college student, White struggled with her transition to a college environment; at one point, she even considered transferring away from IU. It was a mentor, however, that helped her stay and succeed--a path that led White to become a mentor, herself. “She reassured me that the things I am doing and the things I want to do are possible,” White said.